"Building Beyond Your Expectations Since 1974"
- Exatron computer controlled pick-and-place handlers are all kitless. 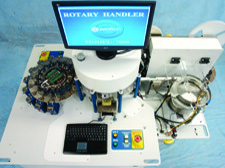 THe handlers provide automated testing marking & inspection of devices in JEDEC trays, AUER boats, waffle packs, and flat carriers, etc.. Models are available from simple benchtop handlers up to large ATE production models. Yes, all are kitless. - Gravity feed handlers normally with tube-in to tube-out handling are made with simple & fast changeover kits for high-speed device testing, sorting and more. Available Options include hot rail, hot chamber, 4 test sites, tube chuckers, tape & reel output, machine vision, and laser marking. - Exatron has produced systems for air pressure/vacuum, audio, electrical, impact/vibration, light sense/source, thermal, and magnetic testing, and laser marking. This machine moves transfers tray to tape 8 devices per at 2000 units per hour, UPH, programs internal electrical ID and marksexternal laser ID in 100% perfect serialized order with no missing, no double, or out of order numbers, no empty tape pockets. No UPH hit even with 1% device failure rate! Serialized 100%! This 8000-3C is designed for fast, high-volume testing, inspection, and transfer of devices presented in stackable JEDEC trays, reaching production rates of 7200 UPH (units per hour), depending on options. 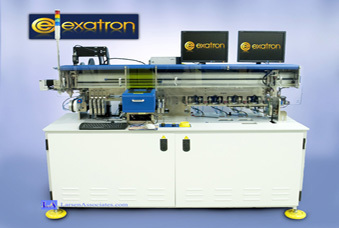 - Exatron Manufacturers a wide variety of their own Tape and Reel machines, from manual feed, to fully automated, to fully integrated units in larger handlers. All reel sizes plus cross over reels available. - Exatron works with all Laser manufacturers and can use the vendor of your choice or help you select the right Laser for the job at hand. From Desktop Laser Markers to Integration in large scale handlers, Exatron knows Lasers having designed and built their own Lasers before the Laser industry became what it is today. Exatron employs full time Lasers experts. Experience counts. - Exatron's extremely versatile high speed Rotary handlers can handle a wide variety of inputs, testing and mulitple binning with ease. Typical bowl feed input, testing, multiple binning, and tape and reel output. Desktop Rotary testing to large scale MEMS handling. Multiple pick ups and device sizes with PC control built in network support, hard disks and a variety of ports standard. - Exatron works with all vision manufacturers and can use the vendor of your choice or help you select the right vision system for the job at hand. Exatron employs full time vision and Laser experts knowledgeable in the fine art of camera vision and software. -The Peregrine line includes the worlds ultra-fast crystal oscillator, flash, and resistor programmers. -Exatron offers the Model O/S-2048 opens and shorts tester. 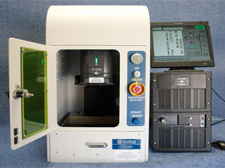 Laser marking, Labelling, Add-A-Mark, Integrating all Laser brands, from Keyence, Trumpf, Rofin, Laservall and many more. To your specifications and needs. OCR, Defect Detection, Quality, Clarity, etc., To your specifications and needs. Lasers from any manufacturer, Test heads, Customer supplied equipment, and more. 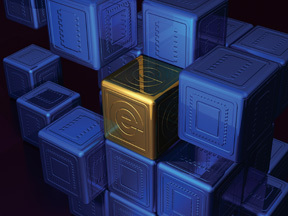 Exatron the industry leader for custom integration for 30 years. Exatron has integrated nearly every brand of tester, laser marker, programmer, vision inspection system, chiller, etc., available. We can add bar-code readers, label printers, ink dot markers, pens, laser markers, and whatever your application requires. With 40 years in the Industy, the longest of any Integrator, Extron has the experience, knowledge, reputation, to provide you with simply the best. With 40 years in the Industry, the longest of any Integrator, Extron has the experience, knowledge, reputation, to provide you with simply the best.